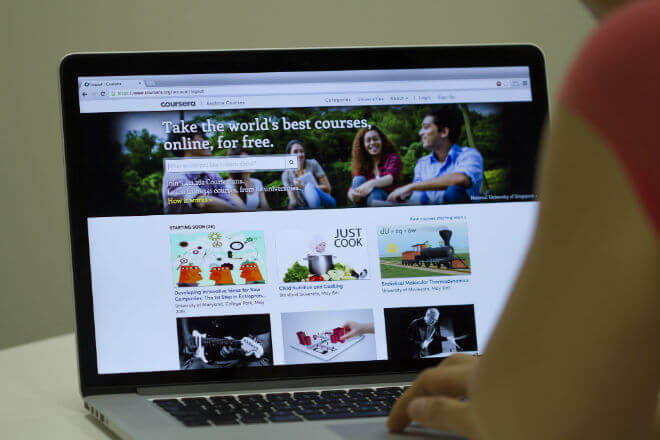 Coursera is an online platform that provides university-caliber educational content in a convenient, accessible, low-cost digital environment. The platform now boasts an impressive 25 million learners. The courses offered on Coursera are designed by instructors at universities and educational institutions—and their names are on their respective courses (they have 149 university partners). In addition to offering over 2,000 courses, Coursera also offers specializations (and in some cases, full degrees). A course is a single program that lasts for a month or a month and a half, depending on the content and the course creators. The price will vary from course to course, but they’re somewhere in the $29-$99 range. If you complete the course successfully, you get a certificate for that course—which can be printed or shared electronically (like on your LinkedIn profile, for example). A specialization is a series of courses that logically fit together. Coursera has over 180 specializations currently available. Depending on the subject, you can take specialization courses independently from each other—we’ll look at this in more depth in just a bit. Specializations cost between $39 and $79 per month, and usually last 4-6 months. At the end of the specialization, you’ll earn a Specialization Certificate. 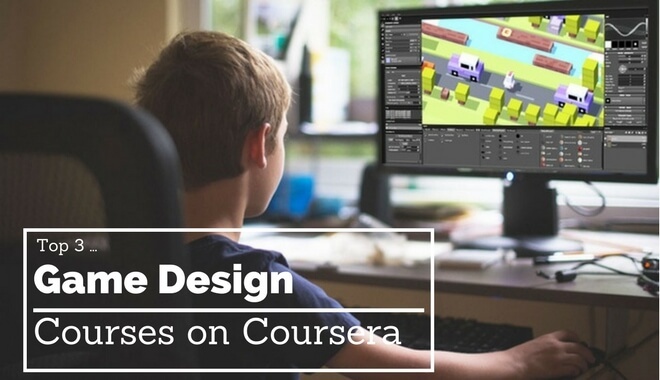 Currently, Coursera offers just under 20 courses relating to Game Design and Development. This includes four specializations. There are certainly courses available to you if you already know your way around game design and you’re looking to hone your skills. But in this article, we’re going to focus on the top three game design courses on Coursera for beginners. Online learning with a platform like Coursera is a great option for beginners, because you can get your feet wet in a new industry without commiting (and potentially wasting) an egregious amount of time (or money). Some courses require as little as 2 to 3 hours per week of videos and readings (might be more when you factor in your time on assignments). That kind of workload is pretty light, and potentially manageable with a full time job. It’s an opportunity to try something new and learn new skills without having to cut the safety nets in your life. 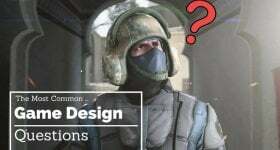 Let’s take a look at the best Game Design course options for beginners. Coursera’s Introduction to Game Design course is created and taught by California Institute of the Arts. Specifically, it’s taught by Fran Krause, who teaches Character Animation at CalArts. It’s a four-week program, with 2-3 hours of material a week. This introductory course is the first course in the Game Design: Art and Concepts Specialization (a five-course specialization taught by CalArts). 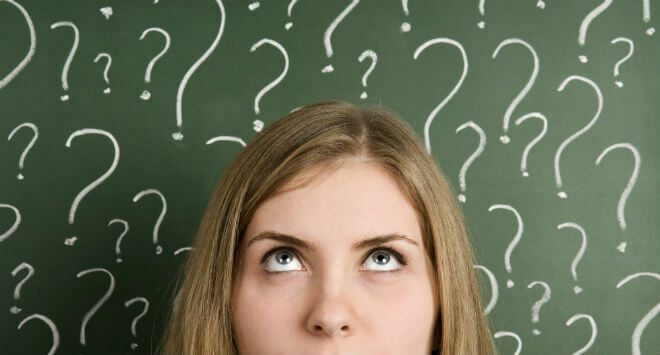 But, it’s one of the courses you can take independent of the specialization (like we mentioned earlier). You don’t need to know how to program for this course—you’ll be making a game on paper. Each week in the program focuses on a different element of game design. Week 1 is for the basics. You’ll take a look at super simple games under a microscope (not literally). Over the course of 6 videos and 1 reading, you’ll ask yourself “what are the principles of very simple games, like Hangman and tic-tac-toe? How do these games work Why do people play them? What are the elements that define games and the gaming experience? And finally, what do games have in common with each other, and what sets them apart? Your assignment for week one? “Create a game on a single sheet of paper.” Don’t slack on this assignment—you’re coming back to this game every week to apply your new knowledge. The full Introduction to Game Design course syllabus is on the site, so we’ll breeze through the rest of the weeks. You’ll learn about gameplay mechanics, gameplay rules, and how to teach those rules to your players. You’ll take what you’ve learned and apply it to the game you created the week prior. Week three is all about narrative elements in your game—how can you use story to get players to start and finish your game? You’ll then creative narrative for your own game. In your last week, you’ll talk about enemies, adversaries, second players, and final goals. Your final assignment is adding multiplayer to your game. And that’s the gist of a solid introductory course to game design. Now, Coursera lets previous learners review the courses they take—let’s take a look at what people said for this program. User feedback is anonymous, but there are 344 reviews on this course, and it received an average of 4.7 stars out of 5. And, one more for the road: “Not enough content for a paid course” (2 stars). The majority of the reviews are positive (and include exclamation marks)—but the negative reviews that are peppered in there help keep expectations grounded. As with anything, you get out what you put in (except for vending machines. And parking meters. And crane games. Aaaand just like that, we’re down the rabbit hole). Introduction to Game Development is offered as the first course in the Game Design and Development Specialization—but you can take this course individually (and the rest of the specialization courses in any order). Michigan State University put this specialization together. Brian Winn is an Associate Professor at MSU in the Media and Information school, and acting instructor on this course. It’s a 4-week program, requiring anywhere from 2-5 hours per week to get through the content. 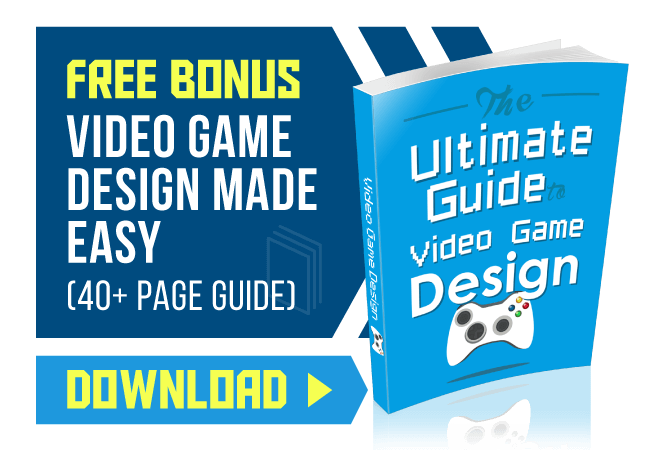 This course has more course content (as many as 21 videos) and more graded content (as many as six) per week than the option one Game Design course. This course is a great option for game designers who want to get their hands dirty with some programming. The average user rating for this course is 4.8 stars, and has 749 reviews at the time of this article. Another user says “It is one of the best course [sic] I have ever seen. I love it as in this course basics are taught and there isn’t much concern on coding. Great course for basic Game Dev Knowledge and basic experience” (4 stars). And that’s about all there is to say on that course—We aren’t going down any rabbit holes this time. The Principles of Game Design course is the second course in the 5-course Game Design and Development Specialization. It’s next in the sequence after option 2 above—but again, these courses can be taken independently of the specialization (and in any order for the specialization). Because it’s in the same specialization, MSU is still the creator. The course is taught by Casey O’Donnell, an Associate Professor in the Media and Information school. As with the other options, this course is four weeks long. Testing, prototyping, learning how to actually make your game fun—these are crucial elements in game design, and don’t appear to be covered in as much detail in other options. This course received an average of 4.4 stars from 222 reviews (at the time of this article). It’s hard to go wrong with these courses. Spend some time looking over the course content and combing over learner reviews for the courses. If you take your time and do your research, you’ll find the best course for you (but review the refund policy before subscribing, just in case). How Is Math Used in Video Game Designing and Programming?